The shares of Sun Pharmaceutical Industries plunged 8.52 per cent to a six-year low on Friday, wiping out Rs 8,735 crore from its market valuation amid reports of a new whistle-blower complaint against the country's largest drugmaker. 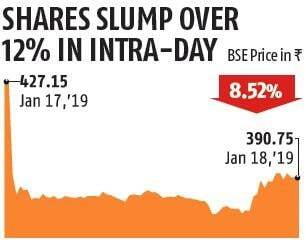 The stock, which dived more than 12 per cent in intra-day trade under massive selling pressure, ended the day at Rs 390.75 on the BSE, with the firm’s market capitalisation settling at Rs 93,751.44 crore. The stock has corrected 25 per cent since the news of a whistle-blower complaint to the Securities and Exchange Board of India (Sebi) surfaced in November. In the last one year, it has fallen 32 per cent. 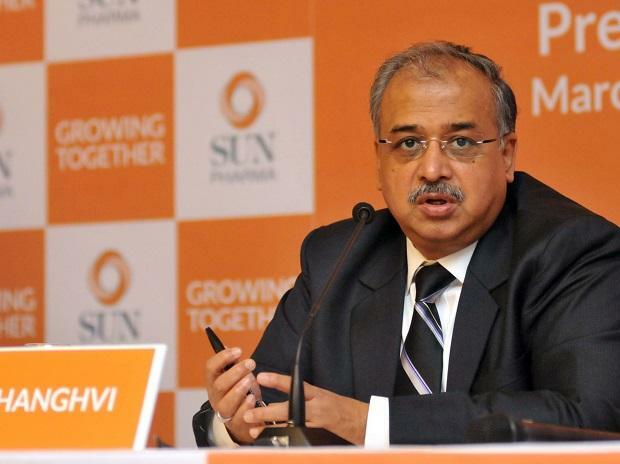 Sun Pharma on Friday urged the markets regulator to examine the role of some media houses with regard to the allegations raised by the whistle-blower. The 172-page whistle-blower complaint alleges that between 2014 and 2017, Aditya Medisales (AML) had had over Rs 5,800 crore transactions with Suraksha Realty, which is controlled by Sudhir Valia, a senior executive and close relative of Sun Pharma promoter Dilip Shanghvi, according to a Moneylife report. Curiously, the stock didn’t react immediately after the article was published on the Moneylife website on Tuesday. The scrip was marginally up on Wednesday with gains of 0.3 per cent. On Thursday, it ended with a 5.8 per cent fall. However, on Friday, the fall was much severe, after the publication granted access to institutional investors to view the whistle-blower complaint. According to market sources, quite a few institutional investors saw the copy of the complaint. 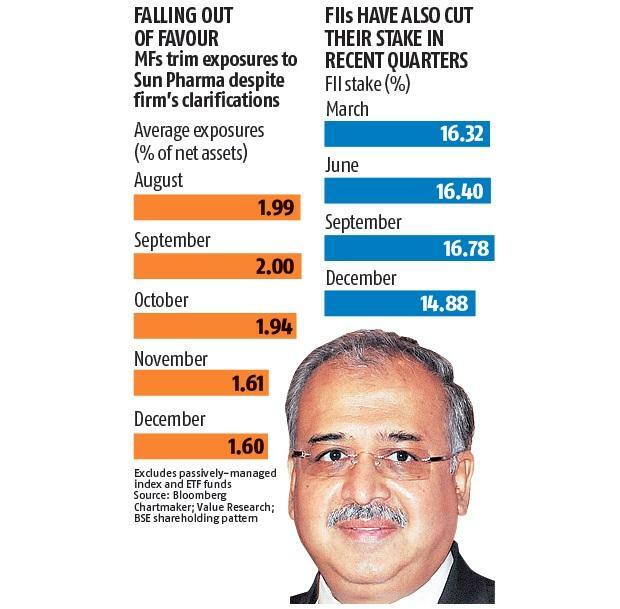 Foreign institutional investors (FIIs) have been selling the stock in recent months. The FII stake was down to 14.88 per cent in the December 2018 quarter from 16.78 per cent in the previous quarter. The data from Value Research showed that mutual funds' average exposure to the company, too, had slipped from nearly 2 per cent to 1.6 per cent in the past two months. Market sources claimed that FIIs liquidated some shareholding during this week, especially on Friday, which might have triggered Friday’s stock price correction. The same, however, could not be independently verified. In a letter to Sebi, which was also shared with the BSE, Sun Pharma said it had learnt about the whistle-blower complaint from media reports. “The said whistle-blower documents and other confidential emails are being offered for inspection to institutional investors by one media house as per the above report, which again we are not privy to,” read the letter signed by Sunil Ajmera, Sun Pharma’s company secretary. “In these circumstances, there is a great asymmetry in the information circulating between analysts, investors and media leading to intense speculation. The availability of information contained in the whistle-blower documents to a set of selective investors does put other investors, including retail investors in a disadvantageous position,” he said. Ajmera went on to add: "We are concerned that certain entities/individuals are adopting unfair trade practices prejudicial to the interest of shareholders and other stakeholders. It is evident from the fact that shareholders value has been drastically eroded within a short span of time due to unsubstantiated complaint/allegation against the company and mala fide campaign launched by certain media houses. We request your office (Sebi chairman Ajay Tyagi) to examine the matter in its entirety, and the role of some media houses and other stakeholders." Proxy advisory firms like InGovern felt that corporate governance lapses overhang would continue on the Sun Pharma stock for some time. "The company has handled the matter in an amateurish manner and not entirely addressed investor concerns," said Shriram Subramanian, managing director, InGovern. According to fund managers, the allegations have taken the sheen off the stock, which was seen as a flag-bearer of Indian pharma. “These allegations could dent investor sentiments for the entire pharma pack as investors may fear similar tie-ups with their related party entities in other pharma companies,” said a fund manager, requesting anonymity. Responding to Sun Pharma's allegations of selective disclosure of documents available with it, Moneylife clarified on its website, “If Sun Pharma believes that these whistle-blower documents should be fully in the public space, then Sebi should be the body to make them public.” It added that for every article it has written on this issue, it has asked Sun Pharma for its comments, consistent with journalistic norms.